Tailored to your wants and needs! THROW AWAY YOUR CHECK LISTS! How would it be to get away from all the stress and fuss of daily living, and just relax? Wouldn't it be nice if someone else made sure you had all the comforts you wanted while you ran the river? That would be a vacation! We provide menus for you to choose from. The food is fantastic, including: shrimp scampi, chicken fajitas, Caesar salad, pound cake, shrimp jambalaya and various sea foods, yogurt, fresh fruits, pineapple-upside down cake, Italian bread, beverages, snacks and more. In fact, if there's something you really want, that we don't have, we will add it to your menu. We can accommodate most special diet needs. Instead of hassling with shopping details and packing plans, focus on the outstanding time you’re going to have on the river. Just tell us what you want to eat and we will make those time-consuming arrangements. The food cost is estimated at $18/day/person, depending on menu choices. You will pay the actual cost of the food along with a small service charge for us to organize, purchase and pack the food. 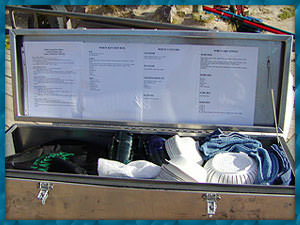 Packing the food includes recipes, pre-freezing, items marked by day and meal, and detailed lists that show where everything is located. In addition to supplying the food, we also supply all the cooking and eating utensils you will need, the wash and spice kits and hand wash station. You will never have to have kitchen gear again. Stop fretting and wasting your valuable vacation time over how to get vehicles from the put-in to take-out. Shuttling was our first service, and we're still the largest, most reliable service in the region. Our responsible drivers are fully committed to road and river safety, and smoking is never allowed in any customer's vehicle. Our shuttle drivers are experienced and trained to handle road annoyances such as flats, overheating, and other unexpected road emergencies. Shuttles are done in convoy; all drivers wear safety belts, drive with their headlights on, and notify other drivers of dangers. We can relay important messages to members of your group when normal means of communication fail, i.e. cellular phones are inoperable, and for other reasons that may come up. We can provide all your River Equipment needs. As experienced river runners, we know what it takes to make your trip safe and enjoyable, by employing the latest and most up-to-date equipment available. We can deliver the equipment to the put in and pick it up at the takeout. Rigging and de-rigging are no longer agonizing events; we take care of that too. Just jump in the raft! Our ambition is to take the frustration and "stress" out of having a good time... so you can relax and really enjoy yourself, the company you're with and the great outdoors. Because Eastern Utah is known for its incredible recreational opportunities, we can help direct you to some of the most exciting locations in our area. As long as you're here, you may as well take in all you can, we're here to give you the help you need. As part of the our information services, we provide you with current weather, road, and river conditions. We can't control Mother Nature, but we can keep you informed. Because we want you to have a great time, we go the extra mile to make sure your desires and needs are met. We've provided this service for over 25 years, we know what and how to anticipate circumstances that might arise.